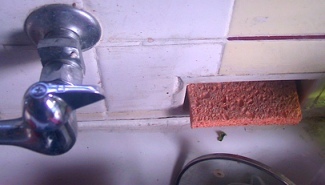 Soak the sponge with water (this is key - not doing so poses a significant fire risk). Place the sponge on a microwave-safe plate. Stick it in the microwave on HIGH for 2 minutes. Don't even TRY to pick it up with your fingers. Use a pair of tongs to remove it from the microwave and leave it to cool or soak it in cold water before using. If nuking the sponge kind of creeps you out or creates so nasty smells (if it does, stop the heating immediately), try boiling it in a little clean water instead. I don't keep a sponge for more than three weeks anyway, but I boil it at least twice a week to kill germs. AND I use a different sponge for my dogs' dishes. You can nuke your wooden cutting board too. If the metal overheats, it can cause the wood to catch fire, so be careful of that. I just pour boiling water over mine.